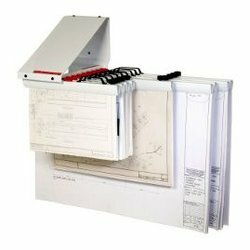 Planhorse are world leaders in vertical filing, storage and archiving of drawings, plans, blueprints, maps, charts, art graphics and other large sheets. 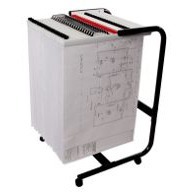 Planhorse mobile filing systems provide quick access and easy retrieval of large format documents. 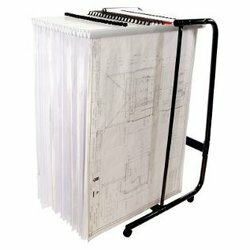 The clamp system enables groups of sheets to be filed and worked upon in the proper order. Each clamp holds with the same strong grip over its entire length between 1 and 100 sheets. 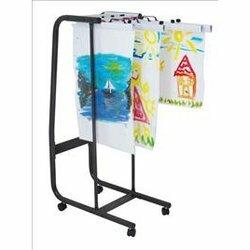 Front loading mobile trolleys hold up to 20 clamps enabling up to 2000 sheets to be filed using 20% of the floor space needed by non mobile cabinets and flat drawers. 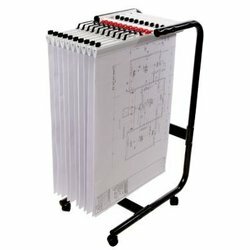 Wall racks are an economic space saving method of filing up to 2000 sheets taking up no floor space. The robust mobile system for high density vertical storage is designed to be aesthetically pleasing and easily accessed in all environments from design office to work site.